We accept the following means of payment: cash, cheque, Visa, Mastercard, and American Express. All room reservations require your personal details (first name, family name, contact information) and a credit card guarantee. You may either book online, call our reception desk on +33(0)3 88 32 66 60, or contact us via our contact form. To cancel your booking without incurring any charge, please contact us at least 48 hours prior to your arrival. Otherwise, you will be charged for the amount of the first night’s stay. Do you recommend any restaurants near the hotel? Yes, we do. There are various types of restaurants around the hotel: traditional Alsatian restaurants, Italian restaurants, gastronomic restaurants and a lot more. Don’t hesitate to ask us for details. The nearest airport is Strasbourg’s Entzheim airport. For more information, visit the website: http://strasbourg.aeroport.fr/en. How far it the hotel from the Strasbourg train station? The Strasbourg train station is a 15-minute walk from the EtC… Hotel, or 3 tram stations. Take either the tram line A or D to get to the hotel. Where is there nearest tram station? It’s tram station Langstross / Grand’Rue, where tram lines A and D stop. You can easily continue on to the Strasbourg train station or to the Rivetoile shopping centre, for example. Is the hotel close to shopping areas? The hotel EtC… Is located in the heart of Strasbourg, near the Kléber square with its numerous shops. In a few minutes, you can also walk to the Les Halles shopping centre. The Mésange street and its luxury shops are just 5 minutes away. At the corner of the Hotel, the Grand Rue, a major commercial artery, offers a plethora of shops, restaurants and bars. You can also discover small shops in the narrow streets of the city centre. Finally, near the Place de l’Étoile, you can stroll in the very popular shopping centre Rivetoile, on the banks of the former industrial harbour. What can I do near the hotel? 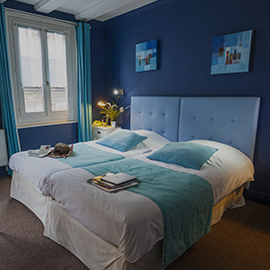 The hotel is the ideal departure point for a walk along the Strasbourg embankments or in the historical city centre. You can go to the nearby Vox cinema or have a drink in one of the numerous bars in the neighbourhood. You can easily reach the Strasbourg cathedral or the Petite France and its covered bridges. Discover the places and monuments you should not miss during your stay in Strasbourg. Find out more about tourism in Strasbourg and Alsace. Can I arrive at the hotel late at night? Yes, the reception is open 24 hours a day to accommodate late arrivals. The EtC… Hotel lacks private parking, but there are a number of public parking areas nearby (some limited to a maximum height of 1.80 meters). Gutenberg car park: It is the nearest to the hotel (2 minutes away), but also the mot expensive. Cost: €44 for 24 hours. We accept animals of small size, provided that you specify it when reserving. The hotel receptionists speak English, French and German. Breakfast is served in our dining room from 7 to 10 am on weekdays and from 7 to 10:30 am on weekends and bank holidays. The rate does not include buffet breakfast. It is available for €10. Our hotel has 4 floors but no lift. Without an elevator it is not suitable for many disabled persons. Unfortunately, the structure of the hotel, typical of Alsatian buildings, as well as its location in the historic centre of Strasbourg does not allow us to make the necessary adjustments. Free internet access is available in all our rooms. How late can I check-out of the hotel? Guests must check-out no later than 11 am. What are the check-in times of the hotel? Earliest check-in is 2 pm. Are the rooms equipped with private toilets? All of our rooms at the EtC… Hotel are equipped with private toilets and a private bathroom (with shower or bathtub). All bathrooms are equipped with hairdryers. Do you have any communicating rooms? Yes, we do have communicating rooms depending on the availabilities. Are baby beds available for the rooms? Depending on availability, sleeping bags and baby beds are available free of charge on request. Don’t hesitate to ask our receptionists for more information when making your reservation. How many rooms does the EtC…Hotel have? The hotel has 35 rooms with different configurations: single, double, twin, triple or quadruple.